Some photos and notes from the past three months on the farm. 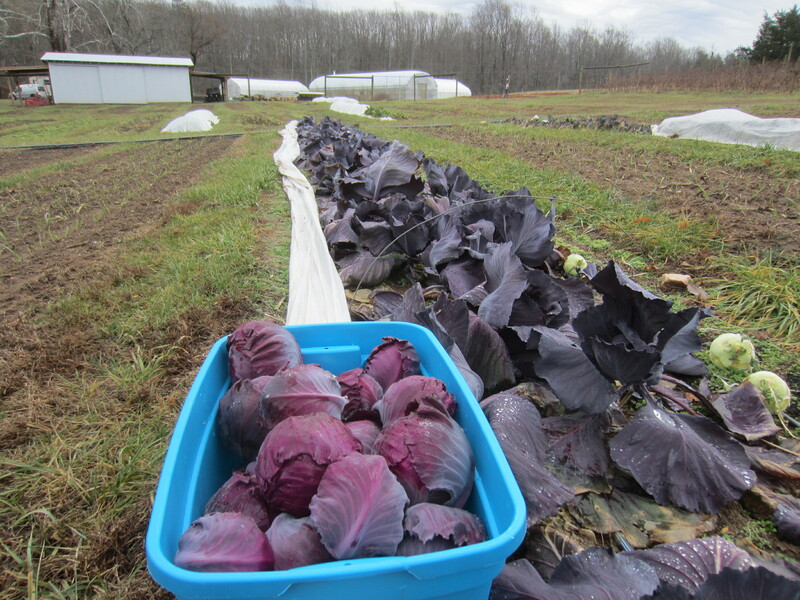 these red cabbages survived through many nights in the teens for an early January harvest! 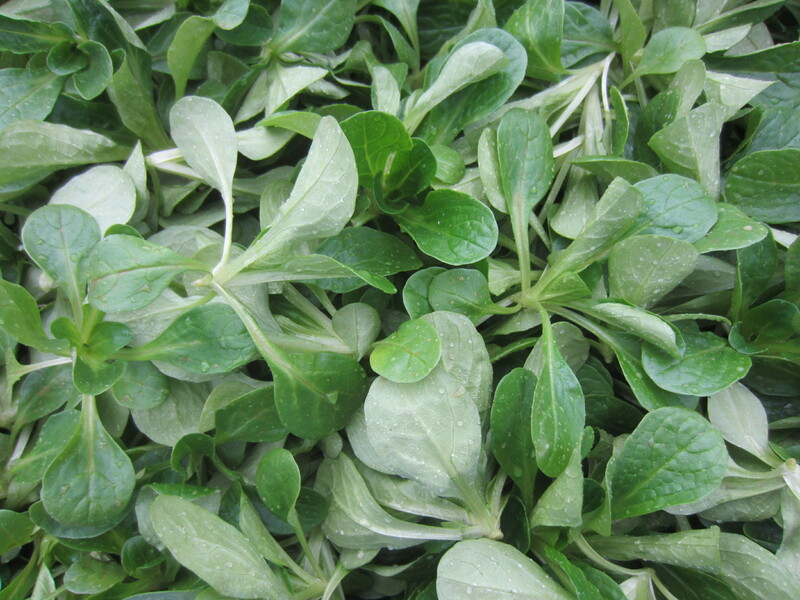 the deer got our spinach, though we had a few spectacular late-fall harvests before they found it. 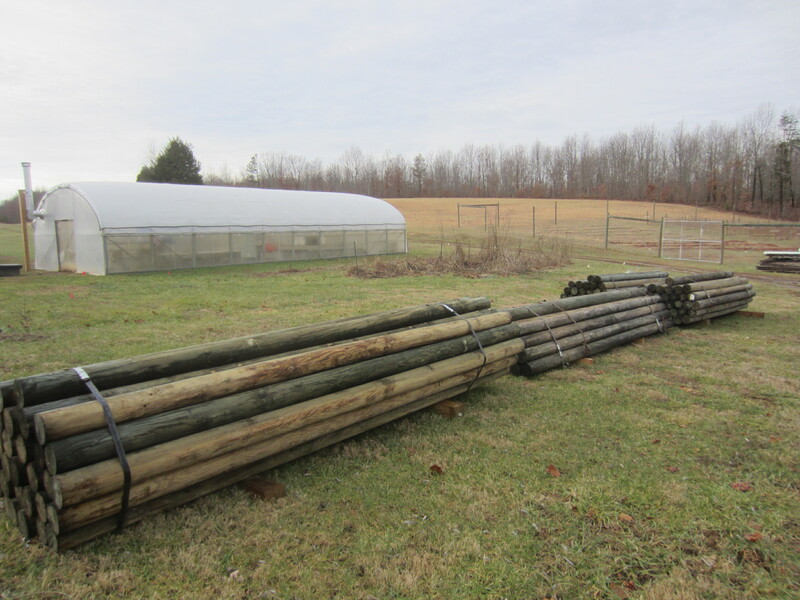 the fencing materials are ready to go for our next fencing project…enjoy the food while it lasts, deer. 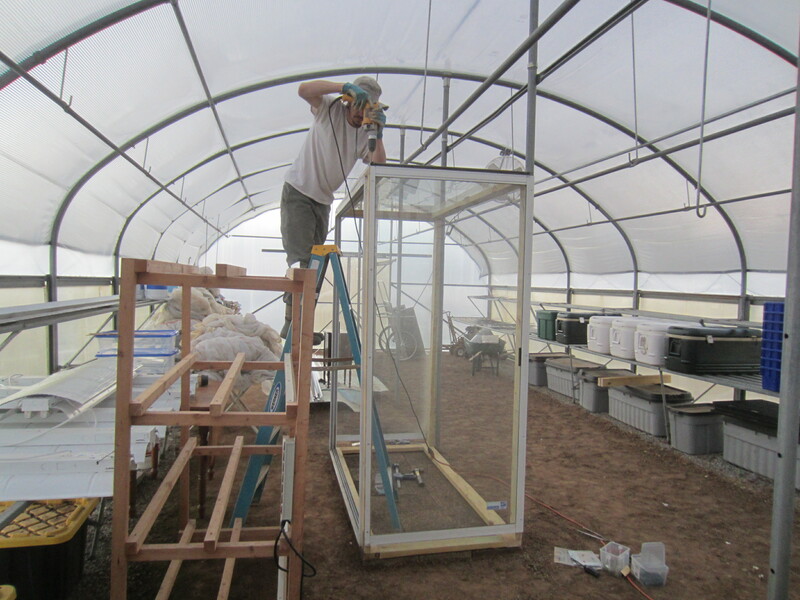 building a germination chamber. Thanks for the doors, Teresa and Herb! 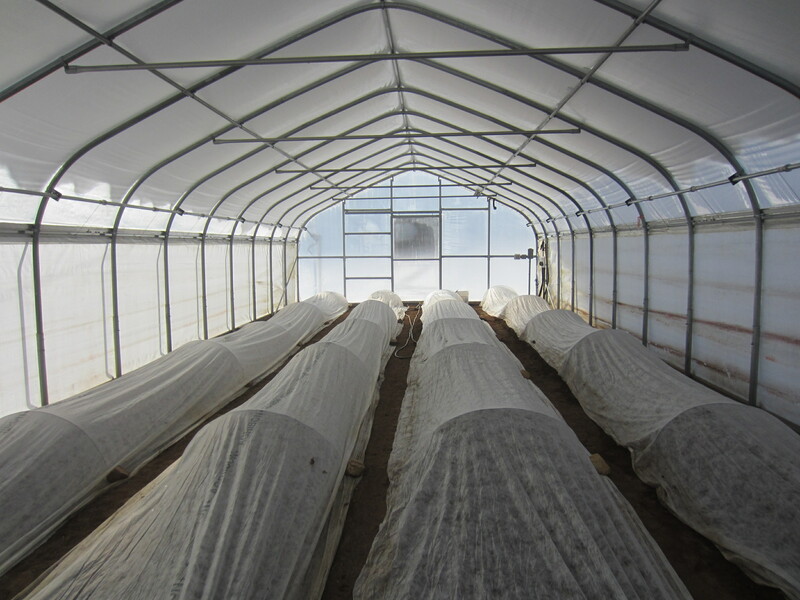 in the little tunnel with snow on the roof, future spring crops waiting for the sun! 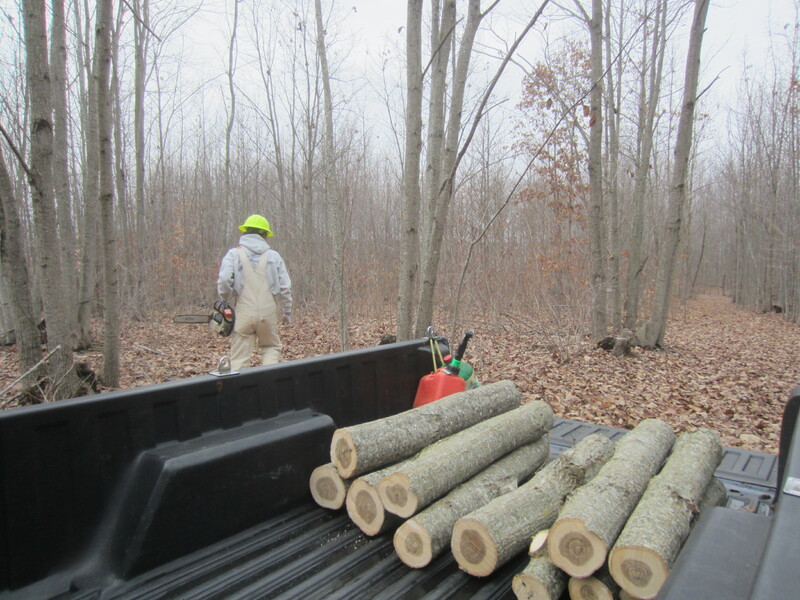 2013 was a productive but challenging year for the farm and we were more than ready for the winter break. 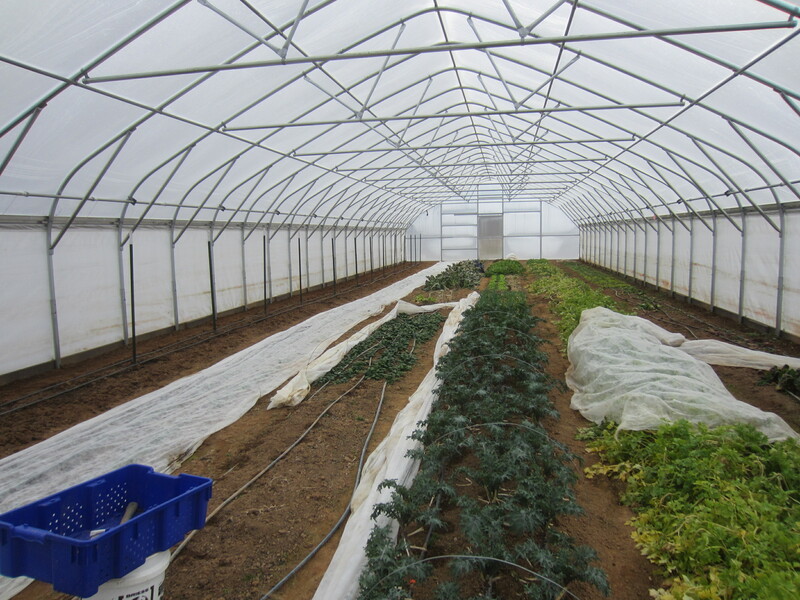 We decided to make some changes for 2014 by discontinuing both our farm share program and growing cut flowers for wholesale, and to focus our efforts on growing vegetables for our Saturday farmers’ market. As we are continuing to develop our farm infrastructure we have to face the fact that we have limited time and are not quite ready to expand to the fullest, and instead of pushing ourselves to the limit as we have for the past three years, we have decided to try to maintain our sanity by having fewer commitments. We want to continue farming for as long as we are able-bodied and not burn out mid-season each year, so sometimes it is necessary to make these difficult choices and have faith that what we are able to do is enough. 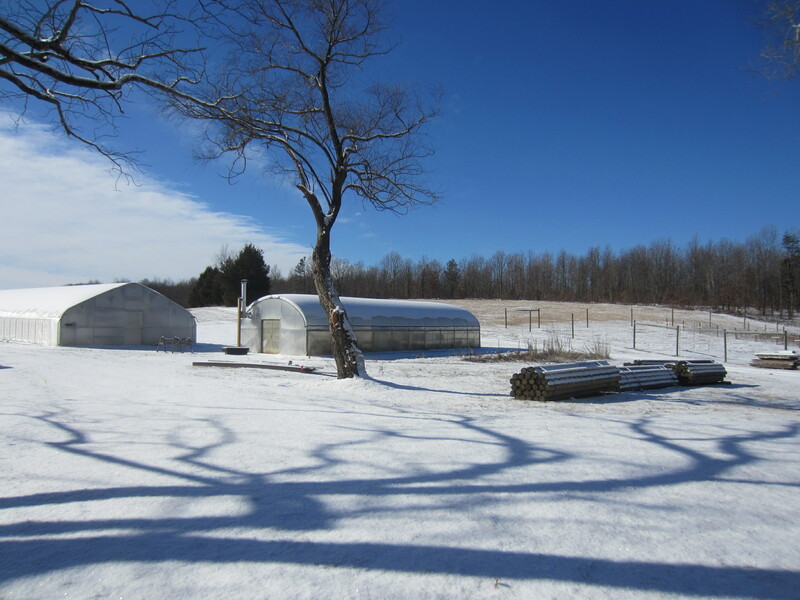 Since we were going to be away from the farm travelling during much of November and December I didn’t put a lot of effort into the winter plantings, so we had what we had, which was not a lot. Most of what I planted was eaten by deer and voles, and other plantings did not survive the super-frigid temperatures of this record-setting cold winter. In the end I was glad I had not planted more that would have inevitably been lost. The kale and spinach were the performers in the tunnel, but I lost my plantings of beets and broccoli, and the chard bed was unimpressive. There is plenty of room for improvement in the coming year. 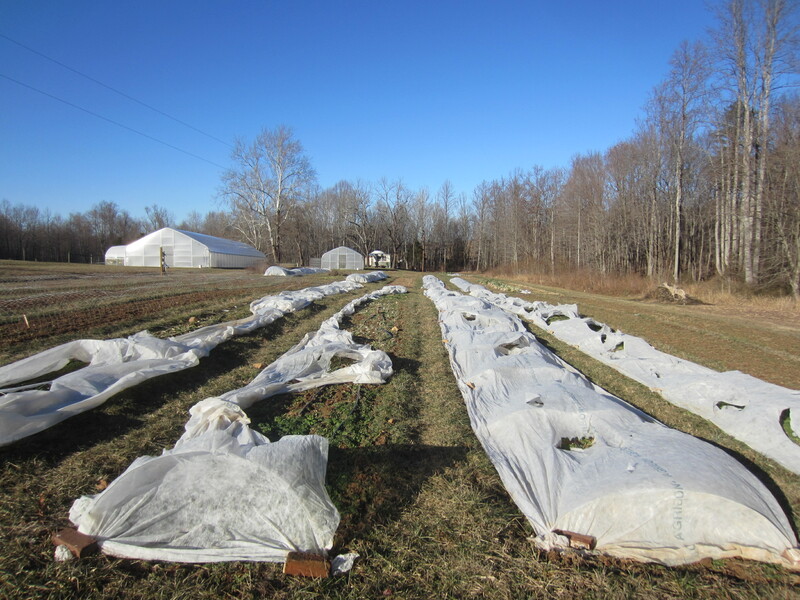 We attended the Virginia Associate for Biological Farming (VABF) conference in January which was truly a wonderful experience. It was inspiring to hear what other farmers are doing in our state and beyond, and so nice to spend time with folks who practice farming with similar intentions and methods. 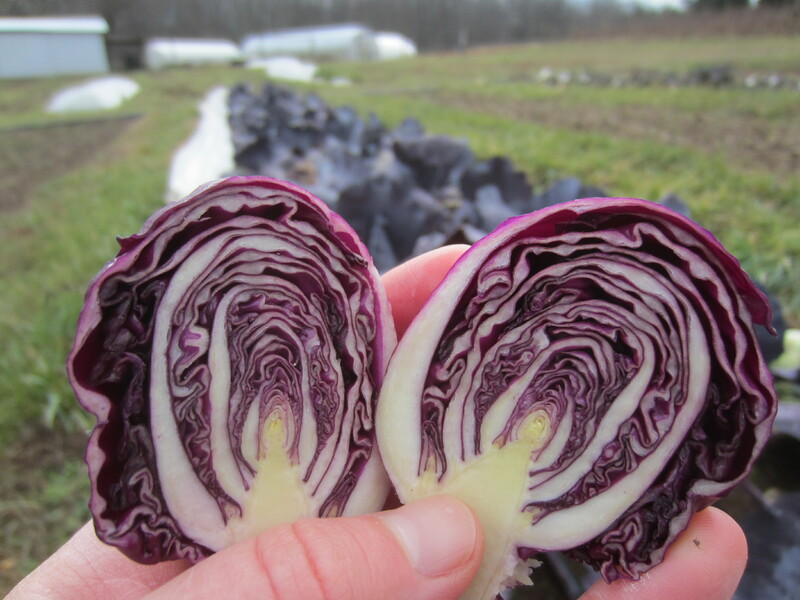 We don’t get away often as we are tied to the farm from February through October and it was a real highlight of the year to rekindle our passion for farming and get ready mentally for beginning a new season. It makes me so happy to have found this profession. 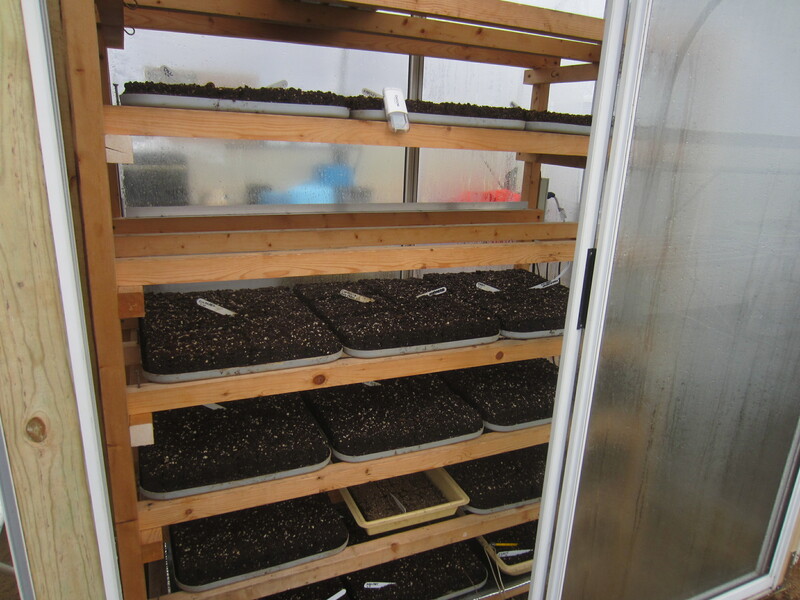 Seeds have been started, and another year of vegetable farming commences. May the vegetable Gods be with you! It was so good to see photos and hear an overview about what has been happening and where you are heading with the farm. Do you cook your celery any special way or do you mostly eat it raw? 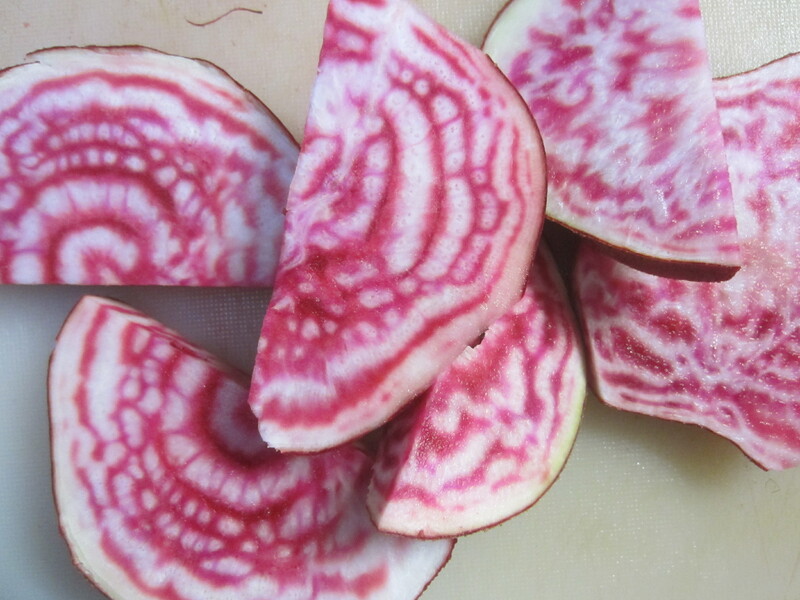 Since it is now your favorite winter vegetable, I’m just curious what I should be doing with it besides peanut butter snacks or putting it into stir fry veggies and things like that. I was talking about celery root (celeriac) not celery, though they are very similar. The celery root is grown for its root, though the ones in the picture also have nice tops that can be used in addition to the root. I mainly use the celery tops for homemade soup stock, diced into salads, or juiced. 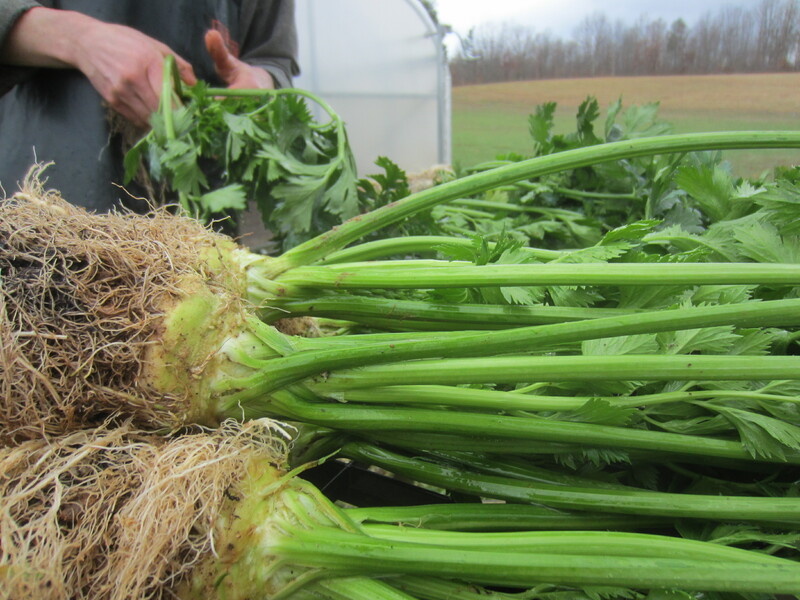 I have been using the celery root sliced thin and roasted or to make celery remoulade. It’s delicious and different! Not sure that I’ve ever seen it at the grocery, though I haven’t really looked. Grrr… Deer. Our nemesis too. I’m very impressed with all you do and how beautiful everything looks. We cancelled our CSA program this year too so we can focus on the farmers market and direct sales. We didn’t want to go through the pressure of having to produce every single week in another crazy year like last year. We enjoyed the VABF conference too. Being around like-minded people really helps charge our batteries. May you have an awesome 2014! Glad we’re not the only ones who find the CSA model a struggle. It’s hard to let our loyal CSA supporters down but you’re right, the stresses of having pre-sold the harvest are high when the weather and crops are not cooperating. I think if we did only CSA and no markets, and were close enough to a population center that people could pick up on farm, the CSA model might be a better fit. The VABF conference was my first and now I know what I’ve been missing! Hope you have a great season too!